I lived in Somerville, Mass., in the 80’s, which was after the Whitey Bulger days though it was the beginning of all the press coverage about those horrid times, so you can imagine how folks looked when I told them where I was living. The apartment was on the edge of Tufts and we walked all over the place at all hours with no trouble at all, even with my funny Midwestern accent. There was the all night diner, my first and still favorite Indian restaurant (that’s the sag paneer against which all others are measured), the phenomenal Somerville Theatre, and the Somerville nightclub. Sadly, I really can’t remember the name of any of them for sure and they have all become defunct. The nightclub was on the Rounder Records circuit and you could see some amazing acts there, up close and personal. Heck, I remember sitting at the next table over from some remarkable artists at the Indian restaurant. Then between sets, the musicians would sit at the bar and talk to whoever came by. The Persuasions had already blown my mind. I have always loved doo-wop, but these guys were taking it so much further and doing it so well. Through some fortuitous timing, most of the original line-up was present that night and they sang the roof off the club. This was just before another uptick in interest in a Capella music, so The Bobs were the main competition and they were pursuing a different sound anyway. Others followed, but never as amazing. The Persuasions never stopped looking backwards for inspiration. After all, this Buffalo Soldier is from The Flamingos and not the wonderful Bob Marley song which came out later. I had never heard them growing up and never wondered why their records were not in all our collections. No one was talking about them when I was young. But they were there making records. I owe my first knowledge of them to The Rolling Stone Record Guide, which I read from cover to cover. Understand that this was before other options. The listings were fairly comprehensive and they rated everything from one to five stars. I figured the least I could do was listen to all the five star recordings, as there really were not that many and even fewer that I had not heard already. In those non-digital days, this meant searching used record bins. I lived in a college town, so that was possible, but still limited. Certain artists, like Jonathan Richman and Richard Thompson, were available, but not the five-star-rated music-just the recent stuff. 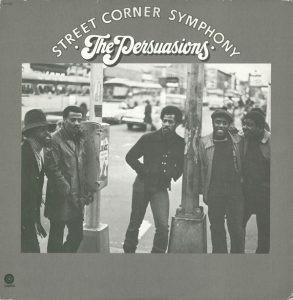 The Persuasions, however, eluded me completely, until I moved to Boston and found their records in the local library, of all places. It took more years before I could find one to buy that I could afford. In short, the privilege of just picking out some Persuasions for a little listen any time I want has not stopped seeming remarkable after all that effort. You’ve Got to Check This Out is a blog series about music, words, and all sorts of artistic matters. It started with an explanation. 224 more to go.